It bends how you want it. After getting my bicycle and going on a long test ride it was obvious that the handlebar was too low, as I got some pain in my lower back. Aside from getting a handlebar which allowed for a more relaxed riding position I also replaced the stem. It was hard to tell exactly how long and high the stem should be. Trying out different sizes can get pretty expensive pretty quickly so I opted for an adjustable one. The benefit of an adjustable stem is that you can experiment with the position as much as you want. The disadvantage is that it is heavier if than a solid one with similar strength and stiffness. I ended up choosing the Contec Duo Up adjustable stem. 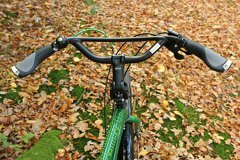 Contec sells a wide variety of bicycle products with many of them also available with brand names by other manufacturers. At first I was a bit skeptical of the brand, but since the cable cutter and handlebar bag were of decent quality I decided to go for a stem as well. According to the manufacturer they are double butted meaning that the material is thinner in the middle and thicker on both ends to save weight but not compromise on strength. 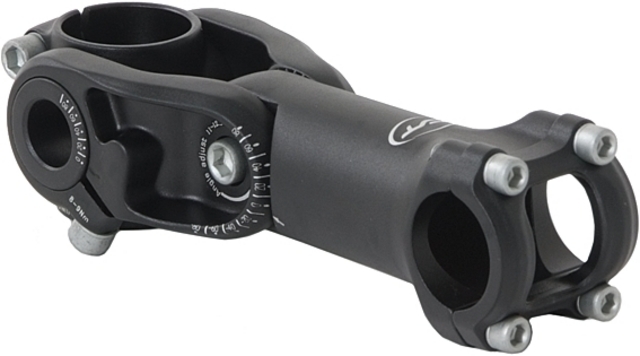 Short 100 mm version of the Contec Duo Up stem. 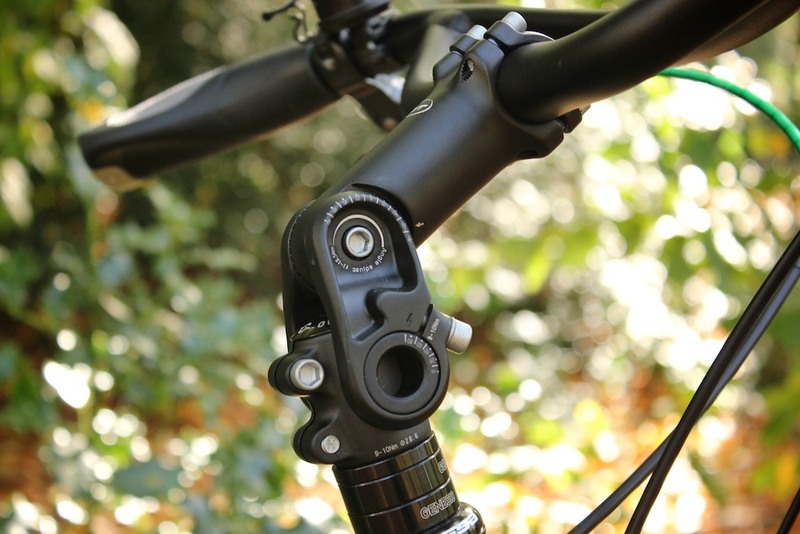 Long 120 mm version of the Contec Duo Up stem. The duo up stem can be adjusted in two ways allowing much better control over the height and length than a stem that is only adjustable in one way. The construction appears very solid, once all the bolts appropriately tightened there is no noticeable flex and it feels as firm as a solid stem. Compared to the solid stem with black bolts that came with my bicycle it looks more bulky, it's not as shiny and has markings for the angle and torque and the gray bolts stand out more. However because it is adjustable in two ways it is possible to achieve a curve that is more pleasing to the eye than some other adjustable stems. Adjusting the stem is fairly simple. The bolts do need to be loosened a lot, but it is possible to adjust and re-righten everything in a few minutes. The range of the first joint is 0 to +80 degrees, the second joint goes even further from -80 to +80 degrees. 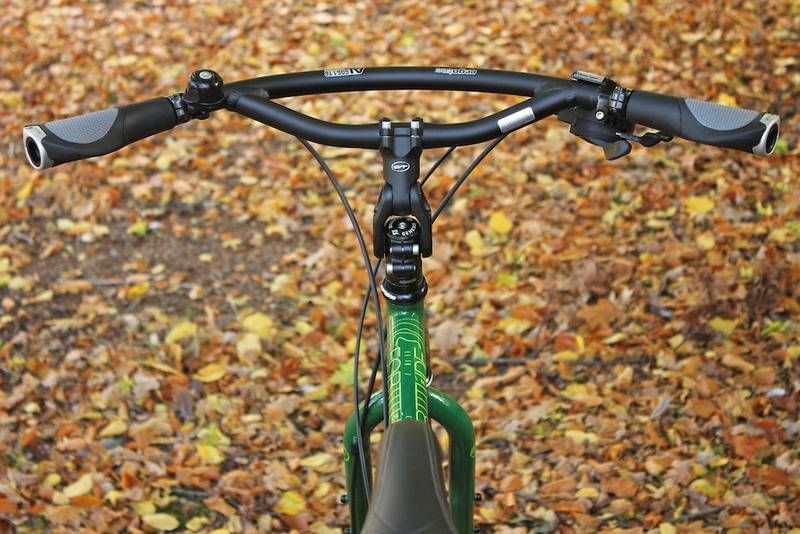 Together with the spacer rings you almost complete control over the position of the handlebar. You can go from an upright riding position to a much more aggressive one. I originally planned to get one adjustable stem, use it to find the right size and then replace it with a solid one. However, after using it for a while I liked it so much that I decided to keep it. I had the 120 mm version and got the 100 mm version for my girlfriend's bicycle. 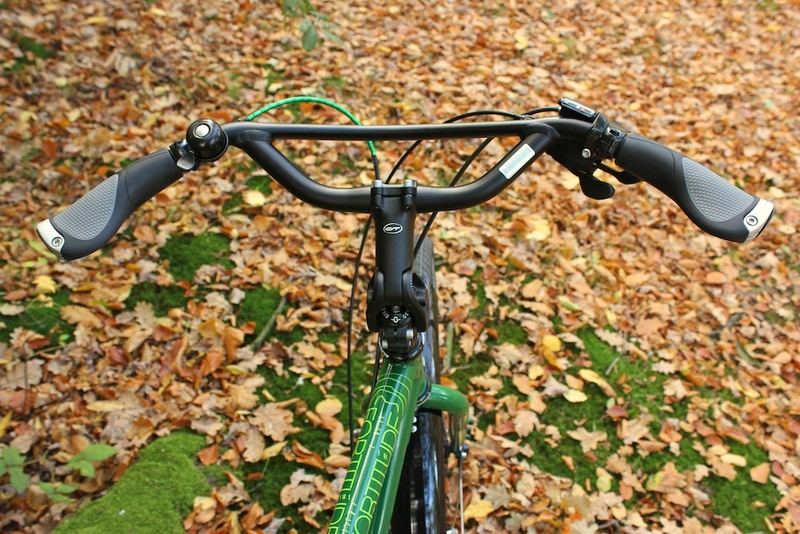 While riding the stem makes a noticeable creaking sound when pushing or pulling the handlebar up or down. 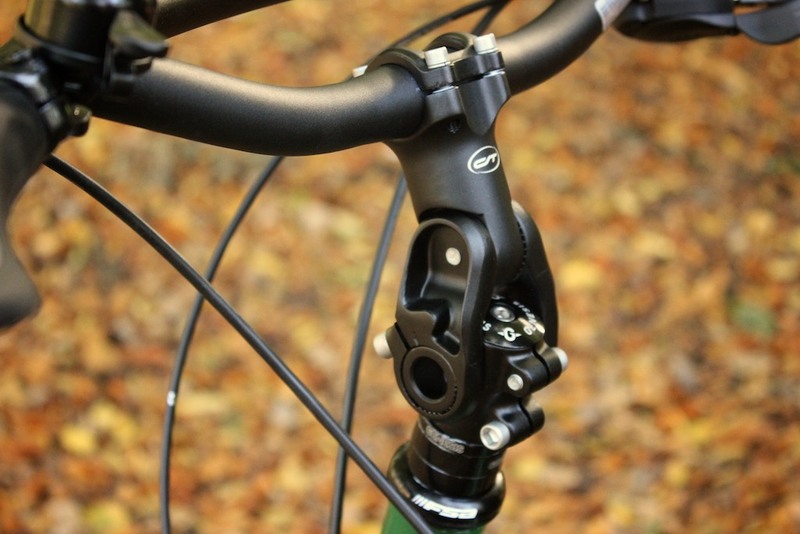 This is slightly annoying, but normal for adjustable stems. For now I like the ability to adjust the stem at any time, as I already did on one ride when my neck was starting to hurt from having to look up too much. However, I can imagine that I will eventually replace it for something stiffer once I settle into a good riding position. 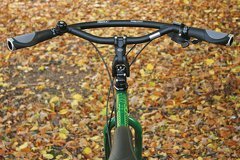 This article will be updated with more experiences after using the stem for a while. 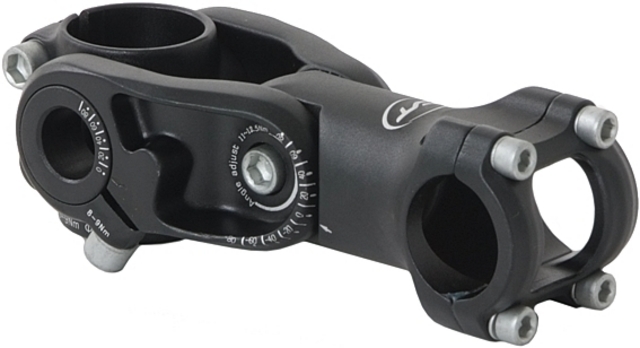 There is a similar product sold XLC by, the handlebar stem ST-T15 which appears to be exactly the same. 120 mm stem with joints set to +80° (bottom) and -65° (top). 120 mm stem as seen while riding the bicycle. 100 mm stem with joints set to +75° (bottom) and -25° (top). 100 mm stem as seen while riding the bicycle.